Avalanche airbag packs are quickly becoming the fourth piece of must-have gear for backcountry travelers, along with beacons, shovels and probes. If you are caught in a slide, you pull a handle attached to the shoulder strap of your pack and a pressurized cartridge or electric fan inflates the airbag, which helps to keep you near the surface of the avalanche and more visible to rescuers. When properly worn and deployed, airbag packs have been shown to be effective in increasing your chances of survival if you are caught in an avalanche. They work on the principle of “Inverse Segregation,” sometimes known as the Brazil Nut Effect. This principle holds that in a moving aggregate of objects large and small (like an avalanche), the larger objects will rise to the top. You can demonstrate this with a bowl of unshelled mixed nuts by shaking it – the larger Brazil nuts will tend to rise to the top, while smaller varieties will sink to the bottom. Deploying an avalanche airbag during a slide effectively turns you into a larger object and greatly increases the chance of you ending up on top of the debris pile when the avalanche stops moving. Keep in mind that wearing an avalanche airbag is no guarantee of survival and the first thing to remember is to make smart decisions so you avoid the avalanche in the first place. That said, your chances of coming to rest near the surface after an avalanche and being found faster are greatly enhanced by using an airbag pack. There are a number of companies involved in the manufacturing of avalanche airbag packs. Each company offers differences in design, versatility, and price, which we’ll try to summarize in this article. What type of riding will you be doing when you use this pack? Heli-accessed lines call for a smaller, more streamlined pack than multi-day hut touring, for example. Where will you be traveling with this pack? Different airlines have different rules and regulations regarding traveling with airbag packs and cartridges, so be sure to check with your airline before you fly. In some cases, you may need to travel with an empty cartridge and refill or replace it upon arrival. The availability of filled cartridges and qualified refilling stations also varies by location. Do you want the potential to transfer the airbag and inflation mechanism from one pack to another? Some makes and models offer this option, which makes it possible to use the same airbag interior features with multiple sizes and styles of packs. Does the pack fit your torso length and body type? Some models are available in more than one length. What is your budget? Avalanche airbag packs come in a wide variety of price points. Will the ski or snowboard carry system for this pack work for you? Some avalanche airbag packs limit the ways you can attach items without blocking the airbag apparatus. Is the pack comfortable when weighted for your typical use? Start by determining where you’ll be using this airbag pack and what sort of riding you’ll be doing with it. If you plan on doing mostly lift-served backcountry with an occasional heli or cat trip, and only need to carry a bit of food and water plus maybe a thin puffy coat, an 18 to 20 liter pack, or even smaller, may be perfectly adequate. Day touring typically requires a pack with a capacity of between 25 and 35 liters. For longer trips, or multi-day hut touring, look for something in the neighborhood of 40 to 50 liters. Keep in mind that not all manufacturers calculate their pack volumes in the same way, and the airbag canister and mechanism takes up space. If in doubt, bring the items you normally put in your pack to the shop and try to fit them in the pack you’re considering. The canister or cartridge is a metal or carbon fiber cylinder that holds highly pressurized gas (normally in the range of 2,700 to 3,000 PSI), which is used to inflate the airbag(s). At present, Mammut, BCA (Backcountry Access) and WARY (Mystery Ranch) all offer user-refillable canisters that can be filled with compressed air at certain ski shops, as well as scuba or paintball shops, and some fire stations. ABS® and ARVA cartridges use compressed nitrogen and are not user-refillable; the empty cartridge is returned to a dealer to be refilled and the user receives a discount on a full one. TSA requires travelers on flights originating in the United States to demonstrate that gas cartridges are empty and not connected to the airbag. If your airline requires you travel with an empty cartridge, you will have to either fill up your cartridge after touching down or buy a new filled cartridge at your destination in order to use your airbag pack. If you have a refillable model, it is a good idea to travel with the extra gaskets, grease and seals you will need for the refill. If you have an ABS® airbag pack, you will also have to show that the activation handle is not live (there is an explosive charge in a live activation mechanism that punctures the cartridge, and you’ll have to exchange the ABS® activation handle along with the cartridge after deployment). New airbag packs from Black Diamond (JetForce) and Arc'teryx (Voltair) use battery operated fan systems to inflate the airbag and eliminate the need for cartridges. The airbag is inflated by a high speed fan, and can be deployed multiple times on a single charge. This system makes air travel with your airbag much easier and gives you the ability to practice inflation of your airbag at home or on snow knowing you have more than one activation per battery charge. Many manufacturers offer the option of swapping the airbag and its mechanism between multiple packs – this allows you to choose the size that is most appropriate for each trip without buying an entirely new pack with a second airbag mechanism (it’s the expensive part). Mammut, ARVA and Ortovox allow the user to swap the airbag mechanism between their own compatible packs or simply remove them when avalanche danger is minimal. Similarly, BCA lets you move the airbag and internals of its Float™ Series packs between its 22 liter and 32 liter models, as well as several K2-branded models with different volumes. As with any pack, it’s important to try an avalanche airbag pack on to make sure it fits. Not all manufacturers offer a choice of torso lengths, so if you are very tall or very short, you may find it necessary to look at a certain make or volume of pack. Load the pack with roughly the weight you intend to carry and see how the straps, back and hip belt feel. Avalanche airbag packs have a harness strap that fastens between your legs to ensure that the pack doesn’t get torn off your body in a slide – make sure you fasten this when you try it on as well. Airbag devices place some restrictions on how you carry your skis or snowboard, since you won’t want to block the path of the inflating airbag while traveling in avalanche terrain. Make sure you understand the carry options for the pack you’re interested in and are okay with how they will work with your skis or board. Think through the process of wearing and using the pack from start to finish. As with a ski or binding system, you are the one who’ll be wearing and using it and your preferences are important. The differences between brands and models may be significant and don’t necessarily relate to price. For instance, the dual airbag ABS® TwinBag system could be considered an advantage, but so could the Mammut/Snowpulse® wrap-around Protection Airbag. Some people consider the bell-shaped pull handle on the BCA Float™ packs to be easier to grab from any angle; some people are fine with a T-handle. You’ll have to make up your mind on your own, but do some research and look at the options first. Think about whether you’re more comfortable pulling the cord with your right or left hand, as well. Some models offer the option of switching sides, others do not. Right-handed people and most skiers and snowboarders often prefer to pull with their right hand; snowmobilers (a huge market for airbag packs) usually prefer to pull with their left hand so they can keep their right hand on the throttle. 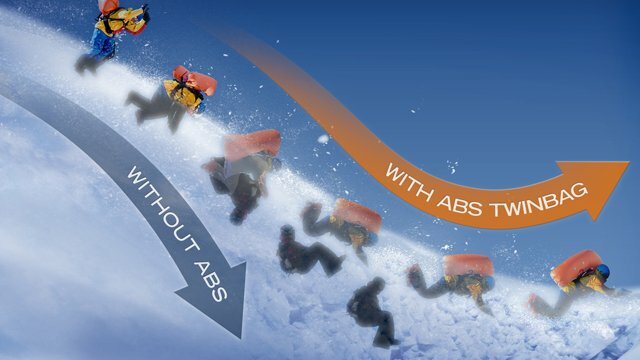 ABS® has the longest history of development and success in the avalanche airbag business, and has kept the most complete set of survival statistics. It's systems offer a two bag TwinBag system for inflation redundancy in case one bag is punctured, and the activation handle uses a small explosive charge to drive the needle that punctures the compressed gas cartridge. Used cartridges may be recycled, but can only be refilled by ABS® and should be exchanged at an ABS® dealer. ABS® offers both “built-in” ABS® Inside systems and its swappable Vario system, which allows you to zip different packs onto a Vario base unit. The list of ABS® partner companies includes The North Face, Quiksilver, Mountain Hardwear and Salomon. ARVA is a well known French producer of packs and avalanche gear who have gotten into the airbag market with a well-designed and minimalist line of packs called "REACTOR." REACTOR airbags packs use a dual chamber airbag and lightweight nitrogen cartridges that can only be refilled by ARVA. The airbag mechanism can be transferred between various packs with volumes between 18 and 40 liters, and the designs are among the lightest and most compact on the market. Mammut, the venerable Swiss clothing and mountaineering manufacturer, offers two styles of airbag packs. The “Protection” style wraps around the head and upper torso of the wearer, providing additional head, neck and upper body protection. The R.A.S. 3.0 (Removable Airbag System) is a single bag system that also extends to the torso. Both styles can be swapped between compatible packs of varying volumes. The Mammut cartridge is user-refillable at scuba and paintball shops with the correct adapter. Dakine offers a series of Poacher R.A.S. 3.0 packs in volumes of 26, 36 and 46 liters. Backcountry Access (BCA), recently purchased by K2, offers the Float™ avalanche airbag packs in a variety of volumes. Float™ compressed air cylinders are user-refillable at scuba and paintball shops using the proper adapter. The latest versions of the Float™ Series packs are well thought out and the pricing is super competitive. Black Diamond's JetForce packs use a battery-operated high speed fan to inflate the airbag, eliminating the need for cartridges. The airbag can be deployed as many as 4 times before requiring a recharge, and eliminates the common air travel issues of cartridge style packs. Black Diamond and their subsidiary PIEPS offer a number of JetForce pack options between 11 and 40 liters. Arc'teryx has entered the airbag pack market with their battery powered Voltair packs in 20 liter and 30 liter sizes. As with the Black Diamond system, it is possible to deploy the airbag mulitiple times on a single charge, and the electric system solves many of the issues inherent in travelling with a cannister-based airbag. Battery powered systems, though more expensive, arguably remove an element of hesitation in deploying the bag in "maybe" situations, and allow for unlimited practice sessions with a minimum of hassle. All manufacturers recommend periodic inspection of the airbag and trigger mechanism, as well as annual test deployment. Inspect your airbag and handle for signs of wear or weak spots after any deployment. Test your airbag to see that everything works before the start of each season (this is a huge crowd pleaser in ski town bars) and have the entire system inspected as the manufacturer recommends. Good luck in your search for an avalanche airbag pack, and may you shred safely and happily without ever needing to use it. *Wearing an avalanche airbag pack is not a guarantee of survival if you are caught in an avalanche. The best way to avoid death or injury by avalanche burial is to avoid being caught in the first place.